New York (August 7, 2013) – Adobe MAX 2013 “The Creativity Conference”, took a very creative set design and projection mapping approach to deliver visuals to an audience of some 5,000 Adobe users and software developers – and over 100K more who watched the gathering’s livestream. WorldStage helped Adobe Systems, Inc. meet its ambitious creative goals providing AV support for the entire event, whose general sessions were held at Nokia Theatre L.A. Live. The annual conference is billed as a source of ideas and inspiration, a place where creative minds meet. While WorldStage handled projection mapping for a dazzling stage set during the 2012 conference, this year Adobe introduced a far more complex configuration, including two overhead canopy screens. The set design featured a huge center hero screen with two curved side returns flanked by a pair of IMAG screens. Two more screens formed an overhead canopy in a T shape. Over all, the WorldStage projection system addressed a 38×120 foot hero screen at center stage, two curved 38×50’ screens to the left and right and at the extreme left and right were two arced 30×37’ screens. In addition, screens suspended above and over the stage measured 60×62 and 30×75’. The position and variety of screens required locating projectors in many unorthodox positions including at the lip of the stage itself. WorldStage furnished Pandora media servers, a Vista Systems Spyder X20 image processor and a Ross 3.5 ME Vision HD switcher. Six Pandora servers were dedicated to the 12 live feeds, providing realtime masking and warping. Pandora Manager handled sequencing, queuing and content management and synchronized 4-channel audio playback to the video. 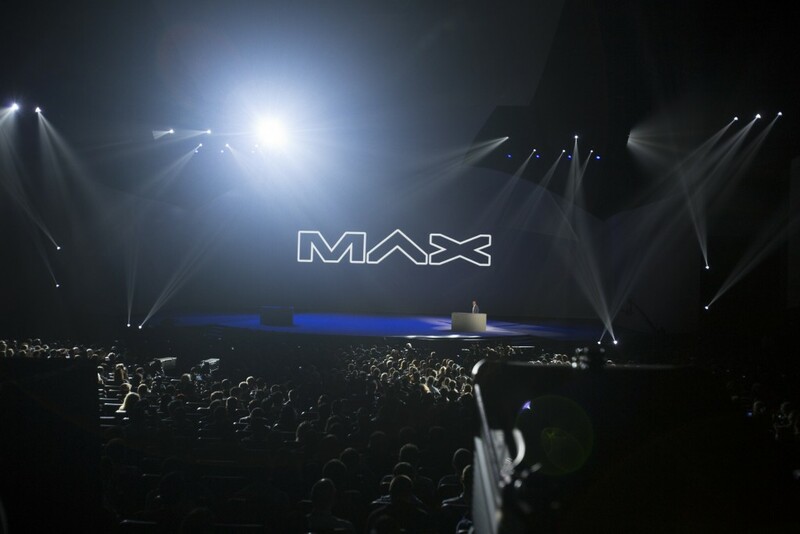 “Pandora did the opening segment on day one of the conference, then the Spyder took control of the hero and side IMAG screens while Pandora continued to feed the rest of the surfaces for the demos and presentations,” Bevan explains. The opening segment on day one entranced the audience with immersive images of clouds, landscapes and warp-speed flocks of birds and colorful exploding geometrics. A similar segment kicked off day two followed by featured work by keynote artists attending the conference. Approximately 5TB of media were ingested and played for the conference by WorldStage; PIX PRODUCTIONS (www.pixproductuions.com) collaborated with Core Studios to create the media content and scenic for the screens. Mark Jepsen was the video director for the program record and web cast feed, that continues to gain viewers at Adobe TV. WorldStage also provided eight HD cameras and three robocams. Robocams mounted on each side of the canopy zoomed in and captured overhead shots of the demo area on stage. WorldStage augmented the theater’s JBL sound system with JBL Vertec speakers for video playback and presentations. A 64-channel Riedel digital intercom system facilitated point-to-point communications between 50 user stations. In addition to projection mapping, WorldStage supported The Office of Tomorrow demo, which was presented as the futuristic workplace of a digital publisher. “We provided a pair of 80-inch LCD touchscreens and a 65-inch plasma, which acted as a table with a touchscreen overlay,” Bevan explains. “The publisher could move paper back and forth between the table and the LCDs with a multi-touch overlay by PQ Labs.” The third robocam was mounted above the 80-inch LCD’s delivered close up shots of the table surface in use. At WorldStage James Sarro was the project manager, Neal Gass the EIC, Jason Spencer the Spyder/screen switcher and Gabe Benso the A2. Freelancers Stan Dickerson and Florian Mosleh were the A1 and Pandora operator, respectively.